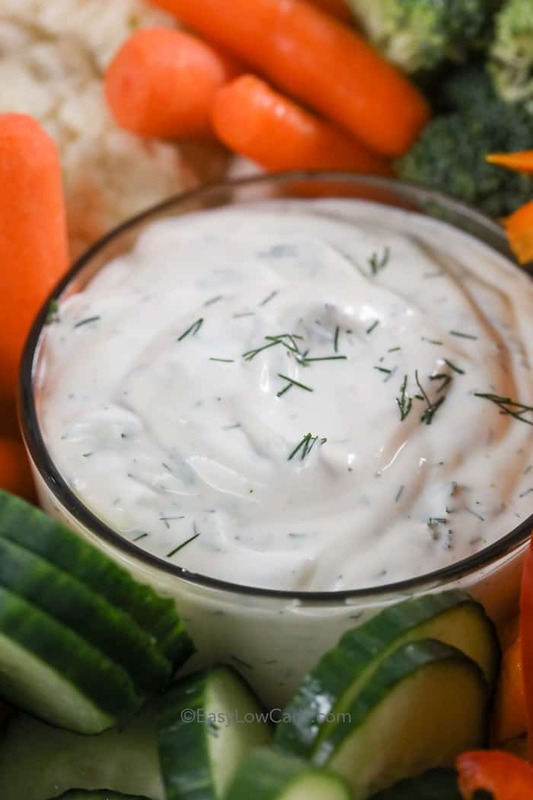 Dill Dip is perfect for parties, snacks or even as a salad dressing! 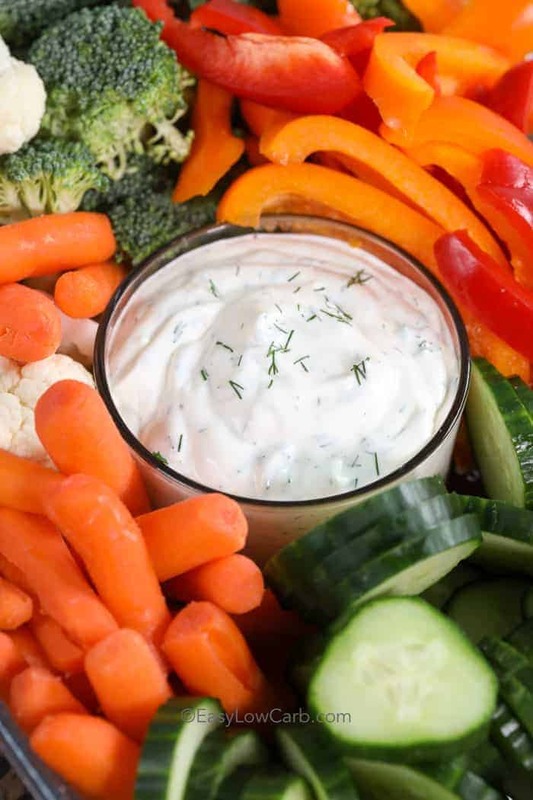 It’s perfect for dipping and dunking your favorite veggies and snacks! This dip is low carb, keto friendly and lasts in your fridge for a week making for a healthy snacking all week long! Any time I’m asked to a party, I offer to bring along a snack for everyone to enjoy. While I often make a dip (like our fave Low Carb Buffalo Chicken Dip), I sometimes just bring along a veggie dip. I know it doesn’t sound all that exciting but putting all kinds of fresh beautiful veggies on a plate always seems to be welcomed at any gathering! Lately it seems the more places I visit, the more people we know that are trying to be keep an eye on what they’re eating or can’t have gluten, carbs or this or that. I find that adding dill dip with vegetables to the mix is a pretty safe bet! While I love veggie dips, I literally cannot stand store bought dip. I quit buying it years ago and instead always create my own amazing dips! You really only need a few things, mayonnaise, sour cream, herbs for flavor and seasonings (like lemon zest, salt, pepper etc). It can just be stirred together and lasts for at least a week in the fridge (as long as your sour cream is fresh). This easy Dill Dip is super quick to make and great for dipping cucumbers as an afternoon snack. It’s low carb and keto friendly making it the perfect thing to keep in your fridge! 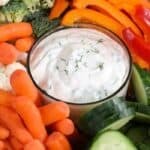 The base of this dip is mayonnaise and I make this dill dip with sour cream to add a bit of tang and freshness. If you don’t have sour cream, Greek yogurt is a great substitute as well! Simply stir your ingredients together and refrigerate for at least 20 minutes (1 hour or more is better). I use fresh dill in this recipe but you can substitute 1-2 teaspoons of dried dill if you’d prefer (although fresh is best). If using dried dill, let the dip sit at least 30 minutes before serving to give the dill a chance to rehydrate. Adding other fresh herbs like parsley or chives works great in this recipe as well depending on what you have on hand! This dip makes a great dressing as well, just add a little bit of heavy cream while whisking to reach desired consistency. 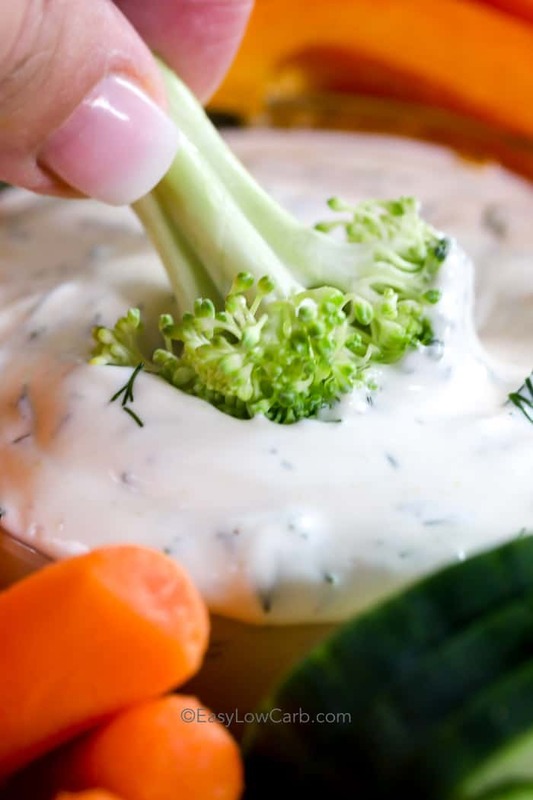 An easy creamy dip perfect for dipping and dunking veggies and more! Allow at least 20 minutes for flavors to blend.